Wedding photography is such a wonderful art form. But traditional photography has lost a little popularity over the years. The best photographers have compensated by developing better wedding posing techniques which result in far better planned shots than your parents had. What to do with the hands? The problem with so many awkward brides, grooms, and wedding parties is what to do with their hands. We’ve noticed that with the best posed shots, creative photographers have put the subjects’ hands to good use to create a more natural posed look. With the groom, a simple technique is to simply have him grab his lapel. For a fun couples shot, the bride can tug on the groom’s tie. For a fun shot of the groomsmen, the bride can simply put her hands on her hips and let them gawk. 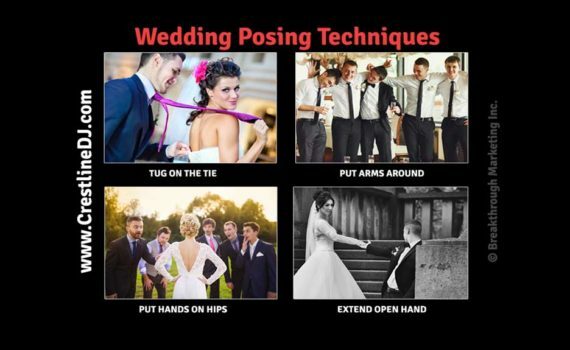 Or the groomsmen can put their arms around the groom with their hands held high. For drama, let the groom simply extend his open hand to his adoring bride. There are some good photographers we’d be happy to refer you to who have developed artful wedding posing techniques. They know how to make your wedding portraits fun and memorable. In a previous blogpost, we discussed the four most popular styles of wedding photography. The are: traditional, documentary, fine art, and edgy. Contemporary traditional photography has blurred the lines between these styles with fun wedding posing techniques that put the hands to good use. When the photographs are finished, we’ll put everyone’s hands AND feet to good use by packing the dance floor. Check out Chicagoland wedding entertainment at its finest.